OAM on the Move is a new region meeting concept. We are proud to present the opportunity for Ohio Association of Movers and industry members to come together and gather new ideas and ways to serve an industry in constant motion. 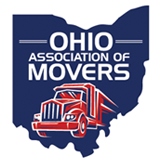 In 2018, we hosted our first OAM on the Move event in Berea, and it was an astounding success with over 25 mover members in attendance. We welcomed another 35 moving company representatives during an event in Columbus. We are excited about the future of this program and hope that it will continue to provide value to the members of OAM.